Pogrebin is correct that the Goldstone report was immediately attacked by Jews and others who were outraged at the slander, reminiscent of medieval blood libels. But she is clearly flying beyond the orbit of Pluto when she says that they did not discuss the contents of the report. One of many pro-Israel bloggers who attacked the contents of the report is the one called ‘Elder of Ziyon’, who wrote more than 25 in-depth articles detailing factual and legal errors in the report, articles totaling more than 21,000 words. In addition. he and several others performed an exhaustive analysis of claimed civilian casualties, and showed that the great majority were indeed combatants (see here and here). A great deal of the research carried out by these writers appears on the Understanding the Goldstone Report site. True, there is criticism of Judge Goldstone himself. How could there not be, given the profound dishonesty of the report that bears his name? And yes, it matters that he is a Jew, just as it matters that Pogrebin is, because both of them trade on their Jewishness as a qualification for their anti-Zionism. But please don’t tell us that Goldstone’s critics ignored the contents of the report and attacked him ad hominem, while you do precisely that to them! And to the Forward’s editors: whatever happened to editorial judgment and fact-checking? The other time, of course, was the Holocaust. We don’t know what the man was thinking, so we don’t know if there is admiration here, or if he simply wishes ‘they’ would let themselves be destroyed without making a radioactive mess. Or maybe it’s just a straightforward analysis. And Mrs. Thatcher’s argument that they should be Arab was somehow more to the point? …in a strange perversion whereby victims of a smear absorb some characteristics bigots attribute to them, an ugly strain of Israeli racism is festering, threatening to delegitimize Zionism from within. Silent centrists must not stand by, idly watching racist rabbis in Tsfat ban selling houses to Arabs, young Jewish hooligans in Jerusalem beat Arabs, and loud bigots rally against Arabs and immigrants in Bat Yam and Tel Aviv. Zionists must reject these immoral and outrageous acts as unwelcome in our otherwise big broad Zionist tent devoted to building a thriving, democratic Jewish state in the Jewish people’s traditional homeland. Jewish racists betray Judaism and Jewish history. Having taught the world how humane and open religion can be, we must never forget Judaism’s sensitivity to others. Having suffered from discrimination, we must never practice it. Similarly, Zionist racists betray Zionism and the Zionist mission. Zionism’s rise is intertwined with liberal democratic nationalism, mixing ethnic and civic nationalism. And Zionism’s mandate to end anti-Semitism must never degenerate into discrimination against others. First of all, I want to say that Troy is a Zionist and I often entirely agree with him. But this is unhelpful. I really don’t want to get too deeply into a dissection of the concept of ‘racism’, but there is one thing that is essential to it: it is dislike or maltreatment of an ‘other’ simply because he is an other. And that’s not what’s going on here. There is a problem between Jews and Arabs and it isn’t related to race, or language, or even — at least on the Jewish side — religion. It’s based on the fact that the Arabs believe themselves to be the owners of the land, all of it, and they don’t want the Jews on it. This leads to all kinds of unpleasant behavior, from terrorism, to serious or petty crime, to demographic pressure, to merely trying to humiliate Jews in various ways. This unsurprisingly creates a reaction among the Jews. The poorly-educated ones respond by becoming hooligans, a form of self-defeating behavior. The over-educated ones respond by internalizing the point of view of the Arabs and becoming traitors, also self-defeating. But the struggle to stay on the land is real. Every neighborhood has a ‘Jewish character’ or not. If enough neighborhoods lose this character, then Israel isn’t a Jewish state any more. In North America this doesn’t make sense (but in Europe it is beginning to). Here in California there is some hostility to immigrants. As more of them arrive, the culture changes. But California is both a patchwork of cultural enclaves and a melting pot. A new culture grows out of the meeting between the original residents and the immigrants. Things change, but it’s not an ideological struggle. Nobody in his right mind sees this as a conflict for possession of land. Zionism is about self-determination for the Jewish people in the land of Israel. The ‘Palestinian cause’ is about expelling the Jews and taking the land, by whatever means works. Polls have showed time and again that the great majority of Palestinian Arabs, citizens of Israel or living in the territories or in the ‘Palestinian Diaspora’, support this cause. The assumption that the behavior of the rabbis of Tzfat or even the hooligans of Jerusalem is entirely motivated by racism, if at all, is suspect. There are much better reasons to want to discriminate against Arabs (but not to beat them up, of course). So it is probably wrong to do as Troy does, and hysterically accuse Israelis of racism, along with the legions of Israel-haters, like the ones in this video. There can’t be a “thriving, democratic Jewish state in the Jewish people’s traditional homeland” if we allow ourselves to be pushed out of it. 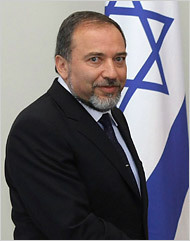 Lieberman’s comments came on the same day that some 10,000 people welcomed the Mavi Marmara back to Istanbul. Hundreds of balloons were released as the ship sailed into Istanbul’s Sarayburnu port, following repairs at a port on Turkey’s Mediterranean coast. The activists, mostly members of pro-Islamic groups, waved Palestinian and Turkish flags and chanted “Down with Israel” and “Allah is Great” as they greeted the vessel. Protesters also boarded boats to welcome the approaching ship, which was adorned with a poster of the nine Turks killed during the raid. Welfare and Social Affairs Minister Isaac Herzog [Labor Party] took issue with Lieberman’s comments, issuing a statement saying that as foreign minister Lieberman does not understand that his job was to “open doors,” not slam them shut. Herzog said Israel did not have the “privilege” to miss this opportunity, even if it “demands Israeli flexibility,” and that a way to repair ties with Turkey needed to be found, even if it entailed “bypassing” Lieberman. In many ways nations aren’t like people. Applying ideas that normally apply to relations between individuals to relations between nations can be what philosophers call a ‘category mistake’. One of the concepts that’s often abused in this way is that of ‘friendship’. Between people, it means a warm relationship, a relationship that allows one to let down one’s guard, to trust, depend on, and to confide in the other. Perhaps diplomats may feel friendship in this sense for other diplomats, but nations do not. Between nations, ‘friendship’ means a congruence of interests which allows them to work in concert. A good example might be the relationship of the US and the Soviet Union from 1941 to 1945, when they worked together to defeat Hitler. 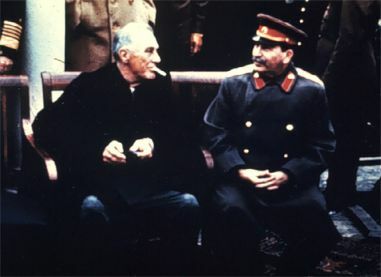 After 1945, ‘Uncle Joe’ was no longer our ‘friend’, he was our ‘enemy’. But what changed? This particular logical fallacy is of great use to a regime that needs to get its population on its side to support its policies. So a great deal is made about the relationship of Turkey and Israel being ‘warm’ or ‘cool’. Turkey, says PM Erdoğan, requires an apology — the nation was ‘insulted’ by the Mavi Marmara affair (in which Turkish thugs tried to kill Israelis and got killed themselves). Nations cannot be insulted. That is a category mistake. But nations can hold general elections, and that is what Turkey will be doing in 2011. So Erdoğan’s strategy is to create a lot of anger and then to force Israel to ‘apologize’. Thus he proves that he is strong, that he is the champion of Islam and the Palestinians, that he defends the ‘honor’ of Turkey and humiliates the hated Israel. And gets re-elected. Since Erdoğan’s Islamist AK party took over in 2002, relations between Turkey and Israel have deteriorated as Turkey positions itself closer to the Iranian bloc and farther from the US. In 2009, Erdoğan took the opportunity of the war in Gaza to demonstrate his righteous anger at Israel by stomping off a stage he shared with Israel’s Shimon Peres at Davos, Switzerland. The AK party has also repressed Turkey’s armed forces, accusing generals of conspiracies against the state. Some of them are being tried now, and face up to 20 years imprisonment if convicted. The military has traditionally been a secularizing influence, and has overthrown governments in the past, so a coup isn’t impossible, although some of the charges are fantastic. The Turkish military is also the group that has seen the most advantage from a relationship with Israel, buying weapons and sharing intelligence, providing another reason for Turkish Islamists to attack Israel. Israel should not try to appease Turkey in the present crisis. For one thing, it’s impossible. Erdoğan’s goal is to get re-elected and reconciliation with Israel would remove a hugely effective issue. An apology would be spun as a triumph over a despicable foe, would help Erdoğan’s prospects and would not improve relations. Israel’s objective with Turkey should be to defeat the AKP, not enable it. Just because nations don’t have emotions doesn’t mean that the emotions felt by individuals aren’t dangerous. The demonization of Israel so widespread in Arab countries, Turkey, Iran and even the UK motivates terrorists to act, against Israel if they can, or against softer Jewish targets. Probably more important, the overall climate of opinion created by the overwhelming volume of anti-Israel propaganda makes it easier for countries to justify actions against Israel — actions taken, as always, in emotion-free pursuit of their perceived interests. An apology or anything that even looks like one will be a lost battle in the infowar. It will imply that Israel lied about the incident and present Israel as impotent and fearful. A weak horse. A loser. So Lieberman is right and Herzog is wrong, in the information realm as well as the diplomatic one. This particular logical fallacy is of great use to a regime that needs to get their population on their side to support their policies. So a great deal is made about the relationship of Turkey and Israel being ‘warm’ or ‘cool’. Turkey, says PM Erdoğan, requires an apology — the nation was ‘insulted’ by the Mavi Marmara affair (in which Turkish thugs tried to kill Israelis and got killed themselves). Nations cannot be insulted. That is a category mistake. But nations can hold general elections, and that is what Turkey will be doing in 2011. So the strategy is to create a lot of anger and then to force Israel to ‘apologize’. Thus Erdoğan proves that he is strong, that he is the champion of Islam and the Palestinians, that he defends the ‘honor’ of Turkey and humiliates the hated Israel. And gets re-elected. Since Erdoğan’s AK Islamist party took over in 2002, relations between Turkey and Israel have deteriorated as Turkey positions itself closer to the Iranian bloc and farther from the US. In 2009, Erdoğan took the opportunity of the war in Gaza to demonstrate his righteous anger at Israel by stomping off a stage he shared with Israel’s Shimon Peres at Davos, Switzerland. There’s lots more, too. 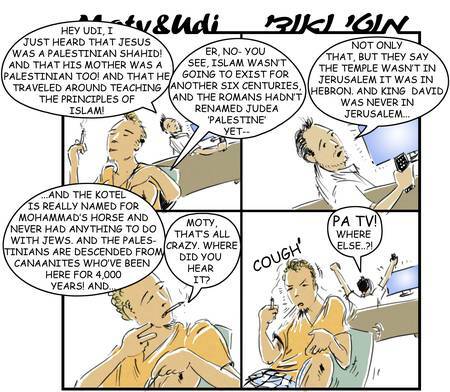 The story of the Palestinian ‘Jesus’ is here, and more examples of invented history are here, as recorded from the official Palestinian Authority (PA) TV station by Palestinian Media Watch. It may appear absurd and funny to us, but many people believe this stuff, just like they believe stories about Israeli ‘war crimes’ in Gaza, or that the Israeli naval commandos landed on the Mavi Marmara with guns blazing, or that Israel plans to occupy the Middle East from the Nile to the Euphrates, etc. The Arabs believe that if they print enough maps on which Israel does not appear and tell enough lies about ancient and recent history, they can cause Israel to disappear (with a little help from Hizballah and Hamas, of course). There are also attempts to spread less-obviously wacky — but still perniciously false — stories in Israel and the West. For example, the organization “Peace Research in the Middle East” (PRIME) publishes a high school textbook in Hebrew and Arabic called “Learning Each Other’s Historical Narrative” which purports to present the Israel and Palestinian Arab “narratives” side by side. In fact, it presents neither — you’d think the Israeli narrative would include a mention of the cooperation between the Grand Mufti al-Husseini and Hitler, or that Jews fought to kick the British out of Palestine, or that the British often helped the Arabs in the pre-state period — but none of these facts are mentioned. The Zionist enterprise is presented as an extension of Western colonialism, and Arab rejectionism as a struggle against colonization. Unsurprisingly, two of the consultants who worked on this project were ISM founders Huweida Arraf and Adam Shapiro. Now there’s an unbiased pair! By day they try to bring Israeli Jews and Arabs together, while by night they make naive foreigners like Rachel Corrie into human shields for Hamas and Fatah terrorists. The United States Consulate General, Jerusalem.